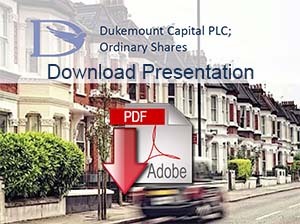 To see the latest share price and trades in Dukemount Capital plc shares click here. The next meeting will be in 2019. Dividends have not yet been proposed. Along with other UK listed companies, Dukemount Capital plc has been asked to warn shareholders about the threat from unauthorised, high-pressure sales firms, known colloquially as ‘boiler rooms’. Often based overseas, boiler room operations target investors illegally offering to sell them non-tradable, overpriced or even non-existent shares. The Financial Conduct Authority (FCA) has produced a share fraud warning leaflet, which provides practical advice for those approached by boiler rooms, including a list of 10 guidance points. Please click here to view the FCA guidance leaflet. © Dukemount Capital PLC 2017-2019. All Rights Reserved.